We stock a wide range of dual 10" ported subwoofer boxes. 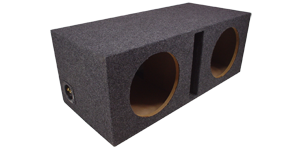 If you are looking for a high quality ported / vented subwoofer box take a look at our selection below. Our enclosures have been designed to work with as many subwoofer models as possible. If you need a box for your 10" subwoofers, we have a box that will work with your car audio system.